A new platform for video reporters is aiming to champion local, community-based journalism by creating a network of freelance multimedia journalists around the UK. WinkBall, which launched earlier this month, hopes to shine a light on positive stories that often take a backseat to national news. "Our journalists will be reporting on the positive, local news that we don't often get a chance to hear about," said Dr James Ohene-Djan, co-founder of WinkBall and lecturer in computing at Goldsmiths. "We will be covering a range of events taking place in local communities – anything from the launch of an innovative business to the review of a new theatre production." WinkBall previously offered video coverage of events around the UK, but transformed into the reporter network as a way to encourage more local news to be heard around the country. It hopes to "change attitudes to the way we produce and consume media in the UK". Freelance reporters looking to participate can do so by becoming members of the WinkBall network and posting onto the organisation's online hub when they have a story idea. Other members then choose if they'd like to team up and work on the project together. A report from journalist Emma Becque at WinkBall. It is then up to the team to find relevant sponsors for the story, who will pay the journalists for their work. A news story on a local community fete, for example, might attract sponsorship from local bakeries or arts and craft retailers. This sponsorship pays the journalists for their time, and therefore enables packages to be freely available for other media outlets wishing to publish them. "News organisations will also be able to commission reporters to do video packages for them, on our service WinkBall Wire", he said, explaining that their aim is to get 1000 WinkBall members up and running by March 2018 before expanding abroad. Content can be produced as an individual story or part of longer, presenter-led programmes divided by geographical locations. Emma Becque, reporter, WinkBall, joined the news network as she wanted to learn the more practical side of reporting. When members join the network, they get access to a bank of WinkBall training films and advice on how to further their skills as a reporter, including how to source stories, carry out interviews, present and edit footage for news audiences. The organisation also provides them with branded merchandise and equipment, such as a camera and microphone, as well as enabling journalists to use its own online editing software to produce news packages wherever they are. "I've been learning on the job," said Becque, explaining the network feels like a community. "We are given in-house practical training as members, and going out and using the cameras and equipment has been really useful." 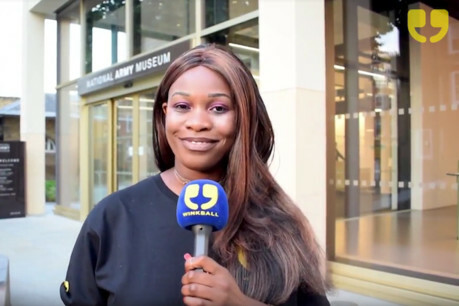 Ohene-Djan hopes the network will help more young people to get into reporting – anyone who has a background in video, presenting or editing is eligible to become a member of WinkBall. "We want journalists to be encouraged to produce more local stories, and we believe this model will enable news organisations to publish them on their news bulletins."